This new 1.55" 16-Hole Steelie Beadlock evolves from the 1.9" 16-Hole Stamped Steelies beadlock version. Besides being aesthetically awesome, this new 1.55" steelie uses an all new Boom Racing aluminum XT500 separable 12mm wheel hub. "XT" stands for Xtreme and 500 stands for 5-lug and 0mm offset. On top of being a very scale looking beadlock wheel and having separable wheels hubs, a bonus is that they are reversible for the "deep dish" look. 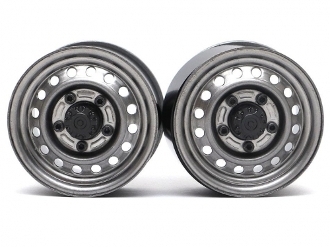 Simply place the XT500 wheel hub on the front face and lock the hubs using the five bolts from the back side.